Common Alder (Alnus glutinosa) is a widely planted native, British tree. Very well suited to damp and wet ground conditions, this tree, along with Willow (many varieties of willow available), forms an attractive native wetland woodland. This tree is often used to prevent erosion of river banks. Also, look at our other Alder trees, whilst being non-native species, they will add a level of interest and diversity to a wetland woodland. 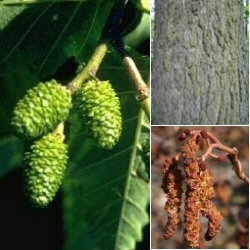 Common Alder is distinguished by attractive male flowers which are formed in early spring in long narrow catkins. Female flowers, which are produced at the same time, are carried in small cones which remain on the tree for more than one season. Expect a height of 25m (83ft). Typically, this tree is planted in groups of between 10 and 25 trees. This number of trees is ideal for creating a wildlife habitat and a meaningful source of food and shelter. Spacing may vary between 1m (3ft 4in) and 5m (16ft 8in). The aim is to mimic what nature intended and thus avoid artificial lines. Blending of one species into another is suggested although bearing in mind different growth rates. Alder and Willow would be fine as they are both fast-growing species.